When you use RSVP, the basic configuration uses the underlying IGP to calculate the LSP route. That is, the LSP travels whatever route the IGP selects. In some cases, however, you may want traffic to pass through a particular node. 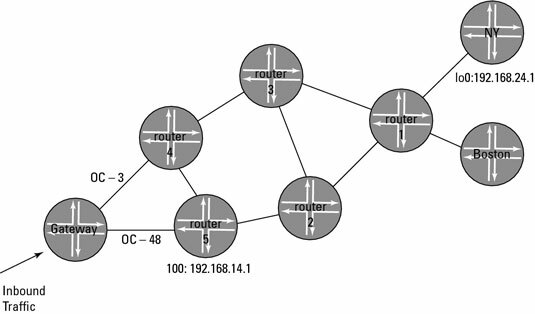 This particular topology has a single ingress point and a single egress point in the MPLS core. Traffic that comes from the corporate headquarters is passed to branch sites. The site in New York has more latency-sensitive traffic than Boston. You want to make sure that the New York traffic takes the faster route while the Boston traffic takes the road less traveled. After you’ve configured a static route and created an LSP, the next task is to make sure that all traffic destined for New York travels through the LSP you just created. What you’re really doing is specifying that all New York-bound traffic use the LSP as its next hop and allow all forwarding decisions after that to be made based on the LSP. When traffic comes in with a destination address of 192.168.24.1, the router associates that traffic with the LSP, and it forwards the traffic to the next hop in the LSP.